And don’t miss their two other great coupons for $2 off a meat purchase (may be printed twice and used at Price Chopper, too) and $2 off any product with Guiding Stars (great for FREE produce!) found HERE. And if you’re looking to try out ShopRite’s Shop From Home service (see here why I love it), place an order today or tomorrow of $200 or more (pick up or deliver now through 1/18) and use the code CANCAN14 to save $30. ($200 sounds like a lot but the $30 comes off before coupons.) 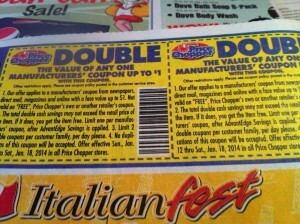 Offer expires 1/13.